Mirepoix USA and the Rhode School of Cuisine have designed an exclusive Tuscan culinary tour which will focus on the region’s celebrated white truffles, porcini mushrooms, and exquisite Italian cuisine. The program, scheduled for October 21 – 27, 2012, will be hosted at the spectacular Villa Lucia and Villa Michaela just outside the beautiful and historic walled city of Lucca. According to Mirepoix USA, a leading online purveyor of specialty gourmet foods and traditional French foods, “An Adventure in Fine Italian Cuisine” is one of the most unique guided tours Tuscany has to offer. The program will include a sampling of Tuscany’s famous white truffles and porcini mushrooms captured at the peak of the season, a truffle hunting Tuscanyexcursion, private tastings of premium olive oil, balsamic vinegar and wine, daily cooking demonstrations and instruction, and tours of the historic cities of Lucca and Florence. A total of seven meals will be demonstrated in the villa’s expansive kitchen. Some examples of the fine Italian cuisine include: Seared Sea Scallops with a Lemon Asparagus and White Truffle Risotto, Grilled Beef Tenderloin with Porcini Fritte and Foie Gras Demi Glace Reduction and Housemade Pappardelle with Porcini and White Truffle Cream. The villa’s executive chef, David Verzello, is an Italian American who has earned multiple honors while studying at the renowned California Culinary Academy. 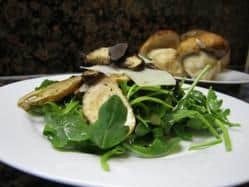 Mr. Verzello works with the cooking school at Drager’s in San Mateo, California, and is currently writing his first cookbook on seasonal Tuscan cuisine. “An Adventure in Fine Italian Cuisine” is an all-inclusive trip and includes all excursions, luxury accommodations, all premium meals and wine at the Villas, cooking demonstrations and classes, all group lunches at restaurants, and airport transportation. Prices start at $3450 per person, based on double occupancy. There is a $500 single supplement for all room types. Designed for the discerning traveler, the tour is limited to a maximum of 20 guests. According to Mirepoix USA, the program will be hosted at Villa Lucia, a beautifully restored 18th century villa, set in four acres of enchanting walled gardens with a heated ancient grotto (Jacuzzi), one large and one smaller swimming pool, one aqua gym pool, tennis court and spa with Hammam Steam Room, fruit orchards, olive groves and ornate fountains. Villa Lucia has nine luxury bedrooms with antique furnishings, historic frescoes and full ensuite bathrooms. Villa Lucia was featured on the Travel Channel and has received rave reviews from all over the world. Since 2004, Mirepoix USA has been sourcing the highest quality specialty gourmet foods and traditional French foods from manufacturers and importers across the United States. The company currently offers over 40 foie gras selections; fresh truffles including summer truffles, Burgundy truffles, Perigord black truffles and Alba white truffles and well as truffle based products; French charcuterie, and a wide selection of caviar. In recent years the online retailer has expanded product offerings to include Wagyu and US Kobe beef, French cheeses, and gourmet gift baskets and gourmet food. Mirepoix USA began offering culinary travel and events in 2012. For more information about Mirepoix USA and their culinary tour “An Adventure in Fine Italian Cuisine”, visit http://www.mirepoixusa.com or call 866-992-9559..